When Motorola merged with Google, one thing that everyone hoped was that from thereon, Motorola will start updating its phones at a faster pace. With the launch of Moto X and its minimal Android layer, this belief gained strength and soon, we could see that Motorola started updating its phones at a faster pace than any other Manufacturer out there. Even its lower end phones, Motorola G and even Moto E launched with Kitkat and were promised fast updated. 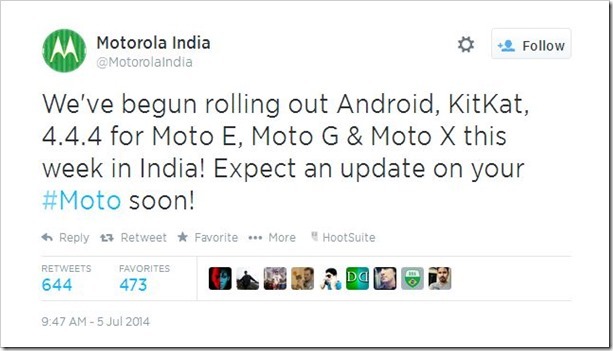 Motorola has kept on its promise and Motorola India tweeted recently that all its phones will be getting Android 4.4.4. By doing this, Motorola bypasses the 4.4.3 update. This is a good thing too as the new version is out there and there is no use to take two step process unlike what some other companies have been culprit of doing. The update will come over the air (OTA) and users will get notification when the update is available for their phone. It will be done in batches therefore people should be getting these in a few days. The size of the update will be around 50-100 MB depending on the mobile phone. It should include stability, security and framework fixes as well as include the new dialer and OpenSSL related fixes. While your phone should automatically intimate you about the update if anyone wishes to check it can be done in Settings > About Phone > Software Update. The updates by Motorola are swift and more importantly, available for all its phones. It obviously doesn’t beat Nexus but that is simply because of the first update advantage that Nexus line up will always have. However, with Motorola updating Moto E with such swiftness shows their realization on the importance of updating the phones. If Motorola updates all the three phones to Android L (when it launches), it will gain a tremendous user base especially for Moto E and Moto G in developing countries. The phones are already selling like hot cakes and have been sold out multiple times on Flipkart (where they exclusively are sold). With quick updates and decent service, Motorola might hold the key to rivaling if not beating Samsung. The only threat these phones might have is from the Android One initiative that intends to reach even more users with updated Android version. However, the brand name of Motorola should be good enough to dominate the market if they play their cards well. VFM Smartphones Moto E (Gen 2), Redmi 2, Huawei Honor 6 Plus Launch In India!